Love this one... thanks Tess! Nice to have participated with magpie today! Have fun everyone!.. Very challenging, plus I managed to mess up my first link - apologies! Thanks so much, Tess - that looks much better! From a mother! Love the Kandinsky. K.
Cool - you make me consider things I never would on my own. Thank you! A silly one from me, Tess. Thanks for a fine prompt Tess. Thanks for another interesting illustration. A childish take on mine - or is it child-like? OH so awesome...can distantly recall this artist of course it has been years since art class so please refresh my synapses! Thanks!!! Bit late with the linking process today. Apologies. Now completed. The Wallisy/ Wassily spelling had me confused!! I thought... maybe a relative? A secret Kandinsky I'd never heard of?? I wouldn't put it past you to discover such a thing!!! absolutely deliciously delightful... love these magpies!!! Today's is a kind of spin-off from yesterday's. A tight squeeze, but hopefully qualifying! Abstract art.....great prompt as always Tess!! Probably not what one would expect, but it's link with memory is a strong one here. 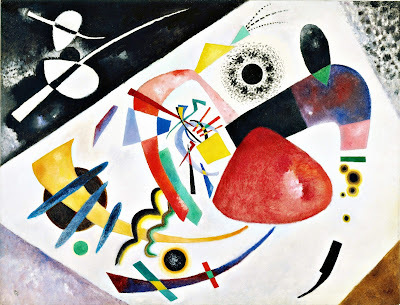 Love Kandinsky, so this was great fun. I like Kandinsky, too. Thank you for this one!